IN the olden time, when wishing was having, there lived a King, whose daughters were all beautiful; but the youngest was so exceedingly beautiful that the Sun himself, although he saw her very often, was enchanted every time she came out into the sunshine. Near the castle of this King was a large and gloomy forest, and in the midst stood an old lime-tree, beneath whose branches splashed a little fountain; so, whenever it was very hot, the King's youngest daughter ran off into this wood, and sat down by the side of this fountain; and, when she felt dull, would often divert herself by throwing a golden ball up in the air and catching it. And this was her favourite amusement. Now, one day it happened, that this golden ball, when the King's daughter threw it into the air, did not fall down into her hand, but on the grass; and then it rolled past her into the fountain. The King's daughter followed the ball with her eyes, but it disappeared beneath the water, which was so deep that no one could see to the bottom. Then she began to lament, and to cry louder and louder; and, as she cried, a voice called out, "Why weepest thou, O King's daughter? thy tears would melt even a stone to pity." And she looked around to the spot whence the voice came, and saw a Frog stretching his thick ugly head out of the water. "Ah! you old water-paddler," said she, "was it you that spoke? I am weeping for my golden ball, which has slipped away from me into the water." "Be quiet, and do not cry," answered the Frog; "I can give thee good advice. But what wilt thou give me if I fetch thy plaything up again?" "What will you have, dear Frog?" said she. "My dresses, my pearls and jewels, or the golden crown which I wear?" The Frog answered, "Dresses, or jewels, or golden crowns, are not for me; but if thou wilt love me, and let me be thy companion and playfellow, and sit at thy table, and eat from thy little golden plate, and drink out of thy cup, and sleep in thy little bed,—if thou wilt promise me all these, then will I dive down and fetch up thy golden ball." "Oh, I will promise you all," said she, "if you will only get me my ball." But she thought to herself, "What is the silly Frog chattering about? Let him remain in the water with his equals; he cannot mix in society." But the Frog, as soon as he had received her promise, drew his head under the water and dived down. Presently he swam up again with the ball in his mouth, and threw it on the grass. The King's daughter was full of joy when she again saw her beautiful plaything; and, taking it up, she ran off immediately. "Stop! stop!" cried the Frog; "take me with thee. I cannot run as thou canst." 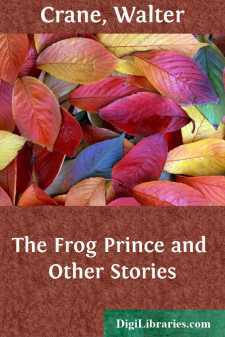 But all his croaking was useless; although it was loud enough, the King's daughter did not hear it, but, hastening home, soon forgot the poor Frog, who was obliged to leap back into the fountain.